Thought Anthony Weiner was causing a stir? 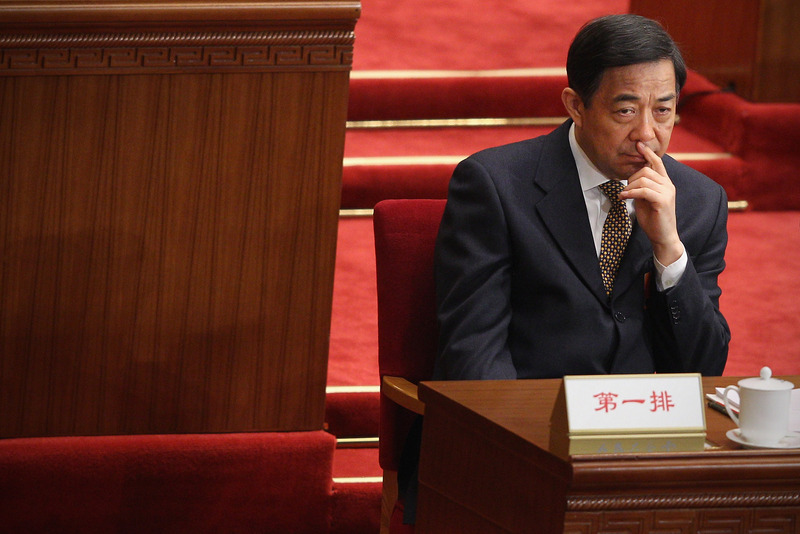 Over in China, one of the ruling Communist Party's star players, Bo Xilai, was today indicted for multiple counts of abuse of power — and it's the biggest scandal to hit the party for years. For the last year, Bo's been locked in a high-profile scandal involving corruption, embezzlement, and murder... and that's not including his links with illegal organ harvesting and genocide. China is, to put it mildly, freaking out. Bo has been the darling of politics for years, a "rock star" in the sprawling metropolis of Chongqing, a much-loved figure whose big-cheese politician dad worked alongside Chairman Mao. Now, he's been kicked out from the party, placed in detention for a year, and on Thursday, was indicted of bribery, corruption, and abuse of power. Bo's early life was exclusive, privileged, and, well, traumatic: his mother was either killed or killed herself (they're still not sure which), his high-ranking father was tortured for years, and Bo himself was jailed for five years. The Chinese government's "Princelings" refers informally to a gang of politicians whose career trajectory was given a helping hand by nepotism: the born-and-bred "golden children" of the Communist Party. Bo rose quickly through party ranks, and was known for being equally brutal and charismatic: he's long been accused of torture, crimes against humanity, and even genocide during attempts to solve ongoing Chinese problems. Regardless, he was well-liked by most of the public for his easygoing demeanor — a real departure from most Chinese politicians. Bo was transferred to run Chongqing, a huge city in Southwest China with 30 million citizens and a severe crime problem. There, he cracked down violently and effectively on the crime population, rounding up gang members and allegedly taking his enemies with them. Bo was adored by millions for safeguarding the city, but things began to fall apart when Bo's vice-mayor, Wang Lijun, told American diplomats early this year that Bo's wife had been involved in a murder, and both Wang and Bo had covered it up. The alleged killing was that of British businessman Neil Heywood, who, according to Lijun, was poisoned with cyanide by Bo's wife. During Lijun's trial, it emerged that Bo, according to today's indictment documents, was involved in financial bribery, abusing state interests, and corruption. He'll now face trial, and any other charges the State decides to bring against him. The scandal is the biggest to hit China's ruling party in many years, and has captured the full attention of the Chinese media. Reportedly, Bo is quite cheery about the whole thing, denying everything, and looking forward to the "opportunity to defend himself" at trial. Carlos Danger isn't looking so bad now, eh?